Arizona Rep. Matt Salmon (R-CD5) was in the thick of things today in what he called "a wild day in the House". The Republican-led House of Representatives twisted and turned today on how - and, whether - to deal with border issues. This morning, Salmon was on Fox News to discuss what was expected in the House today. As things continued to twist, Roll Call tweeted about Salmon's efforts trying to "whip" fellow Arizona Rep. Paul Gosar (R-CD4). Salmon and Gosar now in a spirited discussion. Salmon has shut down. Not showing much interest in what Gosar has to say. Who's whipping who? Meanwhile, Matt Salmon seems to be giving Steve Stockman the business. Paul Gosar, a no, comes over to talk too. WATCH: Rep. Barber On Fox News: Administration Made "Two Big Mistakes", But Now Let's Fix The Problem; Interviewer Hasselbeck Calls It "Refreshing"
Arizona Rep. Ron Barber (D-CD2) was interviewed on Fox News' "Fox & Friends" program this morning about the ongoing crisis of unaccompanied migrant children entering the U.S. Barber acknowledged that the Obama Administration made "two big mistakes" in dealing with the issue, but said that he is supporting the bipartisan and bicameral bill by Sen. John Cornyn (R-TX) and Rep. Henry Cuellar (D-TX) to address part of the problem. Fox News host Elizabeth Hasselbeck seemed excited to have a Democratic lawmaker on who might criticize fellow Democrats. The chyron caption underneath labeled Barber a "Party Crasher", and she tried repeatedly to get Barber to denounce President Obama and Senate Majority Leader Reid. Barber did not take the bait, but did say that the border is not secure until people living in his district along the U.S.-Mexico border feel safer. Nevertheless, Hasselbeck proclaimed it "refreshing", and Barber replied "Very good. Nice to meet you." And, the two mistakes that the Administration made were in not better anticipating this issue "as far back as January", and in not better communicating with local officials in areas where the children were being sent (for processing). A copy of the HUMANE Act introduced by Cornyn and Cuellar is posted below the Barber interview. Former Maricopa County Attorney Andrew Thomas will debut his first TV ad in his campaign for Governor this Thursday. He becomes the 4th Republican candidate to hit the airwaves as the August 26 primary election day rapidly approaches. We do not yet know the total size of the ad buy, but the FCC filing by KTVK (Ch. 3, Phoenix) is for $5,825 through the 25th. Thomas ran for Arizona Attorney General against Tom Horne 4 years ago, and was subsequently disbarred for his actions while he was County Attorney. July 15 was the deadline for Congressional candidates - including all incumbents - to file their campaign finance reports for the quarter ended June 30. Some have already given news media the highlights even though the actual report was not yet filed. Arizona's Politics will comb through the reports and identify highlights, bottom lines, anomalies, etc. 5:05p.m. : Mikel Weisser raised $6,804 in the 2nd quarter and increased his campaign's cash on hand to $3,000. Weisser will be the Democratic nominee challenging incumbent Rep. Paul Gosar (R-CD4) in November. 4:40p.m. : Ruben Gallego continues to lead the fundraising race in the campaign to replace retiring Rep. Ed Pastor (D-CD7), raising $273,000 in the 2nd quarter ($62,000 from PACs/committees). Heading into the stretch run for the August 26 primary, Gallego has $300,000 ($300,048.85, to be exact) cash on hand as of July 1. 4:10p.m. : Rev. Jarrett Maupin is not playing the big-dollar Congressional campaign game. As he faces well-financed fellow Democrats Mary Rose Wilcox and Ruben Gallego for the CD7 nomination (and likely general election win), Maupin raised $8,955 in the 2nd quarter - $6,355 from individuals with last names other than Maupin - and has $8,037 in the bank. 3:45p.m. : Mary Rose Wilcox has raised more than $335,000 (total) for the likely-determinative primary election in CD7. She had $221,409.66 in the bank on July 1, but that is less than primary opponent Ruben Gallego. Wilcox and Gallego announced their candidacies as soon as Rep. Ed Pastor announced his retirement, and the Congressman quickly endorsed Wilcox - a longtime Maricopa County Supervisor. The $243,542 she raised in the 2nd quarter ($35,500 from PACs) more than covered the $109,180 in expenses (plus $60,000 in bills outstanding - including a $39,300 bill to national public opinion firm Greenberg Quinlan Rosner Research for a survey). 3:20p.m. : Rep. Paul Gosar (R-CD4) has no primary election opposition, but he spent more than the $73,025 that he raised in the 2nd quarter. Gosar collected $33,775 from individuals and $39,250 from PACs. His cash on hand dipped slightly, to $195,366.07. Gosar's main expense was the $33,800 that he paid to the Narional Republican Congressional Committee ("NRCC") on June 30, after the NRCC's announced crackdown on caucus members who had not paid their dues. Gosar will face Democrat Mikel Weisser in November, in the solidly Republican district. 3:05p.m. : Martha McSally is the likely Republican nominee, has been acting like it, and raising money like it. Collecting more than $650,000 ($140,350 from PACs), McSally has more than $1.1M in the bank heading into the August 26 primary. The winner faces incumbent Rep. Ron Barber (D-CD2) in November - McSally barely lost to Barber in 2012. And, this is the second quarter in a row where McSally has outraised Barber (and, the 1st in which she also outspent him). And, like Barber (see below), McSally received contributions from at least 18 members of Congress (or, candidates for Congress) - an indication of the national interest in the race. 2:45p.m. : Rep. Ron Barber (D-CD2) collected $554,000 in campaign contributions ($183,000 from PACs) in the 2nd Quarter, pushing his campaign's bank account balance to nearly $1.6M. He only spent $205,000 in the three-month period, but the nationally-ranked toss-up contest - likely a re-match against Martha McSally - is going to cost a lot more in the next 4 months. One (more) indication of how closely the southern Arizona campaign is being watched is that at least 18 fellow members of Congress each chipped in $1,000 from their campaigns. --Loan #1: June 30, 2013, lent $25,000. Repaid April 7, 2014. --Loan #2: September 27, 2013, lent $25,000. Repaid April 7, 2014. --Loan #3: March 31, 2014, lent $50,000. Currently unpaid. Loan #3 was used one week later to repay Loans #1 and #2. Arizona's Politics has apologized to the Walter campaign (accepted), and apologizes to our readers. We regret the error. The portion of the item below which is incorrect has been removed. Andrew Walter campaign manager, Chris Tolino, tells Arizona's Politics that the campaign is very pleased with their best quarterly totals and with how the campaign is shaping up headed into the final weeks. 9:50a.m. : Andrew Walter has $220,081.02 cash on hand as of July 1, and raised $105,000 in the 2nd quarter. Walter is making a bid for the GOP nomination in closely-watched CD9, for the right to attempt to unseat Rep. Kyrsten Sinema. (corrected paragraph, see 2:25pm entry above) Walter did not lend any personal money to his campaign in the 2nd quarter. In fact, he repaid two earlier loans. He lent $50,000 on March 31, and one week later (April 7) repaid himself for the two earlier loans that he had made. GOP opponent Wendy Rogers has $387k in the bank. 9:40a.m. : Independent candidate Jose Peñalosa is running in CD7, and he collected $800 to go with the $4,200 that he contributed to his own campaign. All of that, and then some, went to qualifying for the ballot, which required many more signatures than the candidates in the recognized political parties. Peñalosa's petitions were challenged, but he successfully represented himself - he's an (immigration) attorney - saving a lot of money. Peñalosa has $356.05 cash on hand as of July 1. He will face the winner of the hotly contested Democratic primary, as well as a Libertarian candidate. 9:25a.m. : Rep. Raul Grijalva (D-CD3) maintained the status quo in his campaign's bank account in the 2nd quarter, raising $55,521 ($23,250 from PACs) and spending $56,093. Cash on hand is $108,270.14. Grijalva will face Gabby Saucedo Mercer in the general election. 9:10a.m. : Wendy Rogers has $387,000 in the bank on July 1, down slightly from the balance at the beginning of the period but still impressive as she looks to be the GOP nominee in CD9. Rogers collected $138,367.90 during the 2nd quarter. Rogers spent $19,050 on "polling" as she battles Andrew Walter for the right to try to unseat incumbent Rep. Kyrsten Sinema (D-CD9) in the closely-watched district. July 16, 9:00a.m. : We're now combing through the reports filed after hours (Eastern time, anyway). Looks like there is about a dozen left, then some committees, follow-ups, etc. 11:30p.m. : Rep. Kyrsten Sinema (D-CD9) brought in $581,000 during the 2nd quarter, bringing her total fundraising (for her 1st reelection effort) to over $2.4 million. Of that, she now has $1,595,047.76 in the bank, as of July 1. Of the 2Q contributions, $220,000 came from PACs and conduit contributions. In one of the most hotly-contested districts in the nation, Sinema will face either Wendy Rogers or Andrew Walter as the Republican nominee. (1) This is an escalation of the pattern of incorrect filings by Kwasman campaign. While at least this was timely filed (the previous two reports were not filed on time), the mistakes are amateurish and incomprehensible (at least, by this reporter). Coupled with the errors that were pointed out by the FEC last month, it is even more egregious. (By the way, the Kwasman campaign failed to correct and/or respond to the FEC's delinquency letter by the July 11 deadline.) Triple this with the fact that Arizona's Politics spoke with Kwasman in April about the difficulties his campaign treasurer and/or compliance consultant was/were having. (2) The cumulative figures are a bad error, but a $27,000 personal loan has to be properly reported. While it was disclosed near the end of the 63 page report (page 62), it was nowhere to be found in the all-important "Summary Page" and "Detailed Summary Page". (Just to double-check, we checked the previous report, it was not reported there.) More mind-boggling, it was not accounted for in the "Cash Summary". Is it not noticeable in the campaign's bank balance? Did Treasurer Bret Summers not check over the report he signed? 5:10p.m. : Rep. Ed Pastor (D-CD7) may be retiring, but he still has a $1.3M campaign warchest to spend - as he sees fit with some limitations. In his 2nd Quarter report, he did not fundraise any monies, but he did sell a "DC Donor List" for $594 to his preferred successor, Mary Rose Wilcox. Whether that is market value or not, Pastor's committee made a $1,000 donation to Wilcox's campaign 2 1/2 weeks later. 4:20p.m. : Rep. Matt Salmon (R-CD5) continued fundraising hard during the 2nd quarter, even with light opposition to his reelection in the East Valley district. He gathered $141,797 ($772,000 total) and has more than $500,000 cash on hand as of July 1, 2014 ($501,563.42, to be exact.) Of the contributions this quarter, $57,750 came from a variety of PACs. Democrat James Woods will provide the general election competition. 4:00p.m. : State Rep. Adam Kwasman today continued to have troubles properly filing his campaign finance reports. While his previous reports have been filed late and he is currently under a deficiency report from the FEC on his 1st quarter report, today's 2nd quarter report neglects to include previous amounts raised and spent. Kwasman raised $75,000 in the past three months ($10,400 from fellow Kwasmans) and spent $51,000, thus increasing his cash on hand to $88,078.29. He also apparently lent his campaign $27,000 on June 11, but did not include that loan in his cash flow analysis. Kwasman is seeking the GOP nomination for the highly-competitive CD1; he is battling state House Speaker Andy Tobin and team roper Gary Kiehne in the primary, with the winner to face incumbent Rep. Ann Kirkpatrick. 3:40p.m. : Eagar team roper* and businessman Gary Kiehne lent another $100,000 to his campaign, supplied $35,856 in in-kind contributions and received another $14,200 from family members as he continues to largely self-fund his campaign for the GOP nomination in CD1. He raised approximately $42,000 from individuals and a committee not (directly) associated with the family, for a total contribution amount in the 2nd quarter of $93,150.40. He has now lent $300,000 to the effort (and given an additional $40,856), and his cash on hand on July 1 was $337,022.75. Kiehne is battling state lawmakers Andy Tobin and Adam Kwasman for the chance to unseat incumbent Democrat Rep. Ann Kirkpatrick. * Kiehne lists "team roper" as his occupation on the reports. 12:45p.m. : Rep. Ann Kirkpatrick (D-CD1) filed a mammoth 441 page report, detailing the $416,000 in net contributions - including $140,000 from PACs - received in the 2nd quarter. Her cash on hand for the general election campaign climbs from just over $1.0 million to $1.3 million. The swing district is one of the most hotly-contested in the nation, and Kirkpatrick will face the winner of the three-way Republican primary battle. (3:10: Clarified that the $416,000 is for "net contributions", and added in $5,500 from the joint fundraising committee "Copper State Majority Fund" (Kirkpatrick, Barber, Sinema). 12:15p.m. : Rep. David Schweikert (R-CD6) filed his 2nd quarter report last night, indicating that he more than doubled his cash on hand, from $40,000 to more than $85,000. Schweikert raised $112,499 in the quarter - including $40,000 from PACs - and only disbursed $67,860. Schweikert is running unopposed on the Republican side, and has Democratic opponent John Williamson in November, in the solid GOP district. 11:30a.m. : What if you held a big fundraiser for four major candidates, and only two people contributed? Well, you distribute the $3,600, anyways. The McSally Tobin Rogers Ducey Victory Committee started out with high hopes, and Phoenix attorney Sid Rosen spent $6,840 on the May 15 fundraiser. However, only East Valley builder Ed Robson and California property financier Adam Milstein contributed, a total of $3,600. Because Robson had already maxed out his contributions to Andy Tobin and Doug Ducey, his contribution was split between Martha McSally and Wendy Rogers. Milstein's was divided evenly among the four. 11:10a.m. : State House Speaker Andy Tobin treaded fundraising water in the 2nd quarter, increasing his cash on hand only by $7,000, to $220,502. He raised $176,000 - only $19,000 from PACs - but spent a nearly-equal amount as he attempts to gain the Republican nomination to face incumbent Rep. Ann Kirkpatrick in CD01. He gathered maximum contributions from local sports team owners Nancy and Bill Bidwill (Cardinals) and the Kendricks (Diamondbacks). (His campaign did refund previous contributions from some of the Kendricks' children.) He also received a $2,600 maximum contribution from David Koch, and he continues to disburse monies ($27,000+) to Sean Noble's (formerly tied to the Koch Brothers' network) DC London firm. 10:55a.m. : Shelley Kais - facing an uphill fight to wrest the GOP nomination from presumptive nominee Martha McSally - raised $9,364 in the 2nd quarter. The nominee will face incumbent Rep. Ron Barber in very competitive CD2. That brings her overall fundraising total to just over $30,000. She has $13,313 cash on hand. She paid her company, Kais E. Systems, $3,000 for "graphic design, web design and IT". Another Republican, Chuck Wooten, filed his 2nd quarter report earlier, and has $3,436 on hand. 10:40a.m. : Arizona Rep. Trent Franks (R-CD8) was the first to file this morning, just after midnight. He brought in $43,000+ in contributions - more than half from PACs - but paid out more than that. His cash on hand on July 1 was less than $15,000. Franks is facing a primary challenge from Clair van Steenwyk. Franks donated to a few candidates around the country, including $1,000 to Wendy Rogers, who is running for the GOP nomination in Arizona's CD9. Arizona Governor Jan Brewer (R) has planted campaign signs across various legislative, noting her support of the lawmakers who supported AHCCCS expansion last year. 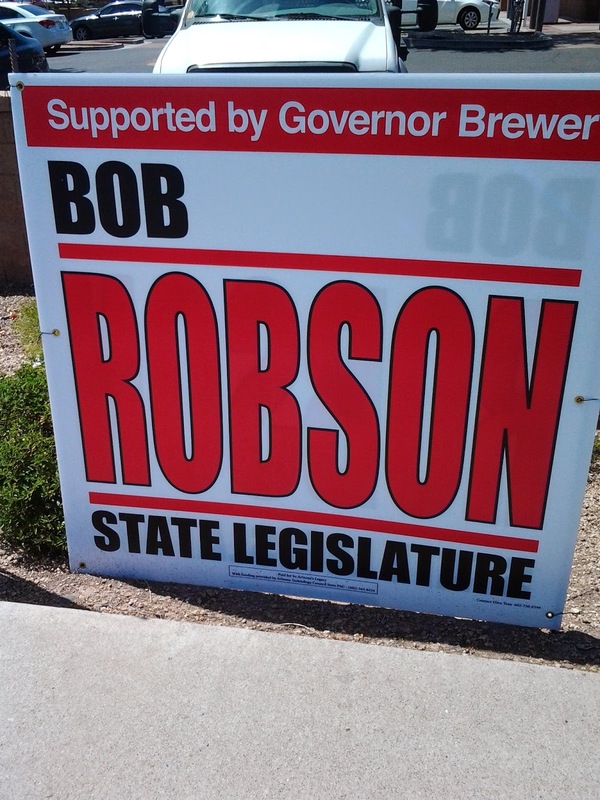 The Robson and Dial signs mimic the fonts and designs of the lawmakers' own signs, although they feature slightly different color schemes. 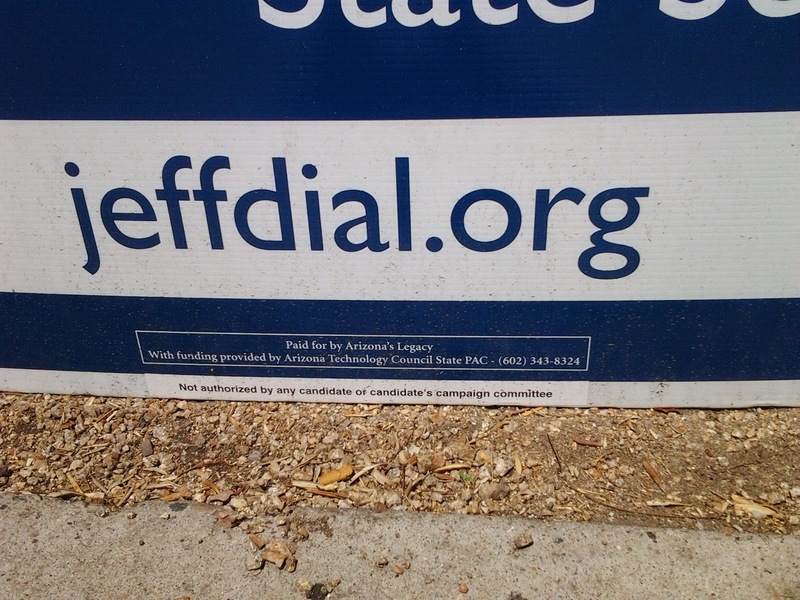 (this often makes it look like the incumbent has multiple signs on the same corner.) 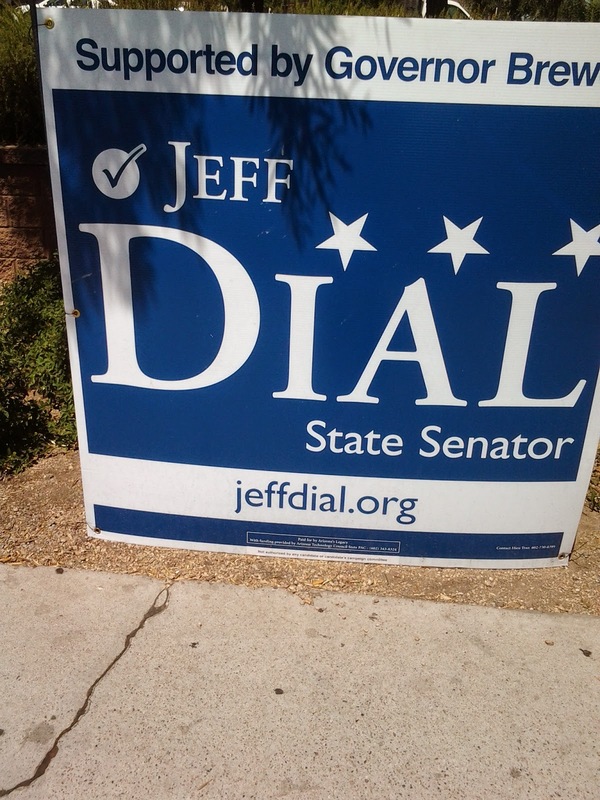 On the top of the signs is the simple line "Governor Brewer Supports". Arizona's Legacy had more than $635,000 in cash on hand as of May 31. The signs note that the signs are "Paid for by Arizona's Legacy with funding provided by Arizona Technology Council State PAC". However, that organization is one of the smaller (business) contributors to Arizona's Legacy. The $6,000 donated by the technology group is dwarfed by the $50,000 put in by the Arizona Hospital and Healthcare Association, and 1/10 the size of the $60,000 stake from the Arizona Chamber of Commerce's Arizona Business Coalition. Republicans who were opposed to the expansion of AHCCCS and unsuccessfully attempted to collect referendum signatures, have recruited and supported candidates to oppose those they deem to be "LegisTraitors". *Arizona's Politics has put a call into Arizona's Legacy for more details, and will update as needed. Arizona Attorney General Tom Horne has placed his order for approximately $200,000 in 30 second TV ads, to begin on July 28 and run through election eve. The FCC filing from KTVK (Channel 3, Phoenix) (reproduced below) shows the planned ad buy for the Phoenix market - $193,304.35. No word yet on the amount of spending for Tucson and/or Yuma. The filing also does not include how much Horne will spend on producing the ad or ads. As of May 31, Horne had $390,000 available to spend on the primary election, which ends August 26. Horne faces Mark Bnovich in the GOP primary, and the nominee will face presumptive Democratic nominee Felecia Rotellini in November. A poll released by an independent expenditure group campaigning for Doug Ducey for Governor shows that the incumbent AG trails Brnovich 25-39% in a survey of likely voters in the GOP primary. The presumptive GOP nominee to challenge Rep. Ron Barber (D-CD2) is taking presumptive action, reserving $460,000 in TV ad time in Tucson... for October (and early November). Martha McSally - who narrowly lost to Barber in 2012 - faces two challengers for the Republican nomination. KOLD (Ch. 13) filed details (here is the first of the five weeks, also posted below*) on the ad reservation today, and the 30-second spots between September 29 and November 4 total $96,385. McSally has not yet filed her 2nd quarter campaign finance report, but on March 31, 2014, there was $847,142 in the checkbook. McSally's two opponents in the primary, Shelly Kais and Chuck Wooten, have not yet responded to Arizona's Politics inquiries. But, one of the immutable laws of human nature is that even big underdogs do not like to be overlooked. h/t to Roll Call (which seems to have an in with the McSally campaign). Also, to Joe Ferguson at the Arizona Star/Tucson.com (which is currently very difficult to navigate). *Contact me if you would like the rest of the documents. 1) Whistleblower Sarah Beattie has moved on from her dual positions in the AG's Office and the AG's re-election campaign, and is fundraising for at least three different political committees. Arizona's Politics previously reported that she had landed on her feet and had been retained as a self-employed fundraising consultant by the House Victory PAC. With the rest of the June 30 campaign finance reports filed, we can report that Beattie has also consulted with the Senate Victory PAC (same leadership as House Victory PAC) and the Paul Babeu for Arizona PAC. All told, she received more than $8,000 from the three committees in the latter half of May - nothing to sneeze at, but nothing outrageous. There were also no apparent connections to Horne opponents, as has been alleged by the Attorney General. An update update (10:15am): Ms. Beattie tells Arizona's Politics that she is also working with Adam Kwasman's campaign for the GOP nomination in Congressional District 1. However, her "main focus" is school. 2) Upon learning that the Arizona Secretary of State's Office had found reasonable cause in Beattie's complaint to forward to the Solicitor General for full investigation, Arizona's Politics picked up the phone to obtain a copy of the determination. That is when we learned that Secretary of State Director of Communications Matt Roberts* was no longer with the office. Hmmm. We received confirmation from both the governmental agency and Ken Bennett's campaign office that Roberts has taken a leave (presumably, unpaid) of absence from the Secretary of State's office to work on Bennett's candidate for the Republican nomination for Governor. According to the SoS Office, the leave will only be through the August 26 primary election - win or lose. Kim Crawford is handling communications for the Secretary of State's office in the meantime. * A big, albeit temporary, loss for the SoS Office - Mr. Roberts is a great spokesman whom Arizona's Politics has tried to pester regularly. Arizona Senator Jeff Flake (R-AZ) gently criticized the Obama Administration's proposal to deal with the sudden surge of unaccompanied minors crossing the U.S.-Mexico border, but maintained that the comprehensive immigration reform bill that he helped shepherd through the U.S. Senate last year would be helping. "We would have significantly more resources on the border itself to actually deal with the situation. And, we'd have far more resources in the courts to bring these cases to trial faster or these deportation hearings. And so yes, I think it would help quite a bit. I'm still for that bill. I think it was a good bill. I hope the House moves on it. It's unlikely that any form of immigration reform is going to move in this environment." As for the $3.7B proposal from President Obama to deal with the current crisis, Flake has a negative impression: "Unfortunately, this package before Congress right now just sends the wrong message completely." He believes that some of the proposal should be shifted from HHS (Health and Human Services) to securing the border and processing those detained. Arizona's Politics has been reporting on the meteoric rise of a pro-Christine Jones Independent Expenditure group, and Better Leaders for Arizona has now committed $775,000 into attacking State Treasurer Doug Ducey in the ever-escalating battle for the GOP nomination for Governor. Now, Ducey is pleading with supporters to pour $250,000 into his already well-funded campaign to respond to the ad blitz. When Arizona's Politics spoke with BLA co-founder and treasurer Virginia Simpson yesterday afternoon, BLA had only filed an $80,000 ad expenditure. Though she indicated that she was raising more money to support Jones, she avoided noting the $775,000 "trigger") report she was about to file. That report is published below. That was filed last night, and this morning, the Ducey campaign began fundraising off of it. Under the email subject line "$750,000 in negative attack ads coming against our campaign", the Ducey camp pleaded with its donors who have already given $1,000 (many) to "max out" and give a second $1,000. With a "$250,000 short term infusion", they will refute the ads. The text of the email is published below. The current ad (ice cream) sandwiches attacks used against Ducey in his (successful) 2010 campaign for Treasurer with statements about Ducey using "front groups" and "dark money". Simpson attempted to assure Arizona's Politics that all of BLA's money is (1) locally raised, (2) is not from the Quayle family, and (3) will be fully disclosed in the next required campaign finance report. She declined to share the information early, even just to confirm claims (1) and (2). Simpson served on the Paradise Valley Town Council for a number of years until 2010, but has not been a political consultant or player since then; some might say that that has now changed. As you may know, a deep-pocketed third party group has begun airing TV ads recycling all the false charges leveled at me during the 2010 campaign. It’s the first wave of several attacks to come, both personally and about my leadership of Cold Stone Creamery. Our campaign has vaulted into a strong position for the August primary, and so the negative ads against me have now begun. Last night the group filed intentions to spend $750,000 in negative ads, and I need your help to fight back. If you or a family member haven’t contributed recently to the campaign, please do so TODAY. We’re going to fight back with ads of our own, and they’re expensive. We need a short-term infusion of $250,000 to help tell our side of the story, and I can’t do that without your assistance. The maximum donation for the primary is $2000 per person. If you’ve given $1000, now is the time to “max out” and get to the $2000 level. This is crunch time, and this is when I need your help the most. Please go to www.DougDucey.com and click on the donation tab, today if possible. The stakes are high for our campaign, and I need your support now more than ever. Please help if you can! Yesterday, Arizona's Politics reported on the outside group supporting Christine Jones' run for Governor, and that the seed money for Better Leaders for Arizona came from a Quayle family-led committee from 2012. In response, BLA has announced that the Friends of the Majority contribution was improper and that it is being returned. "Friends of the Majority was set up to support the election of Federal candidates. The transfer of $9507.89 from Better Leaders for Arizona (BLA) was an error that has been rectified via the transfer of these funds to a Leadership PAC in support of Federal Candidates as intended . BLA regrets and apologizes for the error. This small amount was never utilized for any promotion or media by BLA which undertook no advocacy activity until other funds were contributed for use in the 2014 gubernatorial race." And THAT raises the definition of so-called "Dark Money". While the lines are somewhat blurred (don't worry, I'm NOT going to link to the music video), BLA is not a dark money group simply because it is not telling us the contributors until the state-mandated disclosure deadline. It is like any other PAC or independent expenditure group UNLESS it hides the names of the individuals or entities that originally contribute to it. It COULD still do that by, for example, funneling the contributions through an LLC, trade association or some group that does not have to disclose where the funds originated. Simpson tells Arizona's Politics that she will NOT hide the original sources of BLA's funds. The BLA ad references Ducey's "dark money cronies" and that "Doug Ducey uses front groups". As previously documented by Arizona's Politics, Ducey used $925,000 from a group that is classified as "dark money" in 2012; Sean Noble and his "Americans for Responsible Leadership" hid the sources of the money used by Ducey to help defeat Prop. 204 (education sales tax). Arizona Rep. Ann Kirkpatrick (D-CD1) will be one of five candidates to benefit from a fundraiser brunch later this month featuring Maryland Governor Martin O'Malley and House Minority Leader Nancy Pelosi (D-CA). Kirkpatrick is running for re-election in CD1, which is one of the 13 "toss-up" districts in the nation (according to the most recent Cook Political Report ratings). The fundraiser also benefits Andrew Romanoff, running in a toss-up district in Colorado, and three other candidates in districts rated as "leaning". The outside money battle in the Republican gubernatorial race is now joined, with the Quayle quadrant providing seed money for Better Leaders for Arizona ("BLA"), which today began airing an ad attacking Arizona Treasurer Doug Ducey and supporting former GoDaddy general counsel Christine Jones. BLA began airing the ads today, and has committed at least $28,000 for one week's worth of 30-second spots. BLA formed last fall, just in time to accept the closing monies from a Quayle & friends-funded Super PAC called Friends of the Majority, which dedicated all of its $745,000 in expenditures to attacking Rep. David Schweikert in the hard-fought 2012 primary between two sitting Representatives (post-redistricting). BLA's initial request for ad rates indicates that its "issue" is "Better Leaders for Arizona Support Jones". Jones has already been attacked by a couple of dark money outside groups. Both BLA and Friends of the Majority disclose its donors. BLA's initial finance report is through 2013 and indicates that its only initial funding was the $9,507.89 in excess funds from Friends. Friends' largest contributors were Cerberus Capital (Former VP Dan Quayle is head of global investments) and BTC Consulting (a Quayle family company). Its latest report, through May 31, 2013, showed no additional monies raised. However, more than $75,000 was raised from as-yet-unknown contributors in June. On Wednesday (July 1), BLA filed with the Secretary of State's Office that it had spent more than $80,000 on "Marketing Services". Arizona's Politics spoke with BLA organizer and Treasurer Virginia Simpson when it first requested ad rates on June 26. Simpson claimed that it was "very early", there was no ad yet, and that she would call us when there was. She declined to name any contributors other than the Friends of the Majority seed money. Arizona's Politics has also questioned Ducey's possible connections to some of the IE (independent expenditure) ads attacking Jones and Smith and supporting Ducey. Arizona's Politics has also investigated the Treasurer's acceptance of dark money in the 2012 initiative campaign (as Chairman of the group opposing the continuation of an Arizona sales tax increase). The couple of retired Arizona Congresswoman Gabrielle Giffords and retired Space Shuttle Commander Mark Kelly will help convince the Democratic party that they should hold their 2016 national convention in Phoenix. Ann Wallack, co-chair of the "Phoenix 2016" effort, told Arizona's Politics today that Giffords and Kelly are the Honorary Co-Chairs and will greet the Democratic National Committee delegation when it visits Phoenix on September 10-11." Kelly flew four space shuttle missions, commanding twice. Giffords represented much of southern Arizona in Congress. She won the respect of people worldwide with her courageous battle to recover from the attempted assassination and mass shooting spree in Tucson in 2011. The background of the hero & heroine* couple supporting the Arizona bid is especially relevant because other cities have seen success trotting out celebrity quarterbacks or zoo animals to greet the committee selecting the city for the 2016 Republican National Convention. *Wallack's tweet prompted Arizona's Politics to check the definition of "hero". Without cross-referencing or noting "see also, heroine", several dictionaries - online and hardcover - define "hero" as being a man. Other than that, both Giffords and Kelly are each appropriately referred to as "heroes". National Democrats Checking Phoenix Out For '16 Convention; What Stars Will Greet Them? UPDATE/CLARIFICATION, 8:45pm: Ann Wallack tweeted back to Arizona's Politics to let readers know that "actually, the Mayor helped with the Republican bid also. He flew to DC with them. Seth and city staff helped both parties." (Original text remains below.) Wallack also gave this comment: "We are very excited to shine a light on PHX and our fabulous facilities!" You can view Phoenix's video montage here. Phoenix gets its chance to wow the DNC this September, with the goal of hosting the 2016 Democratic National Convention. Other cities vying for the GOP's convention have trotted out elephants or Mr. Football - who will Phoenix use to make an impression? Phoenix will get to make the final impression on the committee, who will be visiting the other finalists this summer (Birmingham, Cleveland, Columbus, Brooklyn and Philadelphia, in that order). The trip to Arizona will be September 10-11 - still hot, but not AS hot. Phoenix lost out on its bid to host the Republican National Convention. Dallas and Cleveland are the two finalists in that competition. Interestingly, the Arizona GOP was in charge of the unsuccessful bid, but Phoenix Mayor Greg Stanton's Deputy Chief of Staff Seth Scott is heading up - along with Ann Wallack - the effort for the Democratic Convention. Stanton and others made an in-person pitch in Washington two weeks ago. So, how should Phoenix try to make the most of their opportunity to make a big, final impression on the Democrats' committee? Arizona Rep. David Schweikert (R-CD6) is joining fundraising forces with Tea Party powerhouse (libertarian wing) Senators Ted Cruz (R-TX) and Mike Lee (R-UT). Fellow Rep. Thomas Massie (R-KY) is also part of the new joint fundraising committee. Schweikert - an overwhelming favorite to easily win re-election this fall (he will face non-fundraising Democrat John Williamson in the GOP-dominated district) - has been focusing his fundraising emails on the need to help elect other conservatives to continue battling President Obama. The four Congressmen filed a statement of organization for the "Lee Cruz Massie & Schweikert Victory Committee" this past week, and list Sen. Cruz's Treasurer as the man in charge of collecting and distributing the funds for the JFC. Along with Senator Rand Paul (R-KY) and Rep. Justin Amash (R-MI), they make up the big six for the major Tea Party player FreedomWorks, and were featured in FW President Matt Kibbe's "libertarian manifesto" earlier this year. No word yet on how the new JFC is going to raise monies for Schweikert and the other recipients. Arizona is now the western edge of "the South"? The tweet - with a map and headline grabbing me simultaneously - literally forced me to look into the matter further. Many people will see the news coverage over the next few days, and many will try to use it to score political points: "The South Is Essentially a Solid, Grim Block of Poverty". That was the headline on the liberal-leaning Huffington Post - I saw it tweeted and re-tweeted by two well-known professionals who have lived and/or worked in Arizona. There you see the Grand Canyon state as the westernmost edge of the grim block of deep South, deep blue states deepest in poverty. Of course we have a significant population living under the poverty line and we need to do better, but is it worse than in our neighbors to the north and west and is it as bad as the ingrained images we have of the rural, deep South? And, is it somehow related to being on the southern border. Digging behind the headline, the map and the articles gives us some better perspective on the issue. Let's begin by defining what that map shows. It shows that more than 30% of Arizonans (and people in the other deep blue states) live in census tracts where the poverty rate is 20% or greater. A census tract is a very small population area (between 1,200 and 8,000 people, generally). Thus, we are looking at a measurement of how concentrated the state's population is in "poverty areas" - two states could have the same percentage of people living with an income below the poverty threshold and still end up with different shades of blue depending on how economically diverse the neighborhoods are. The first anomaly - and perhaps most importantly - is the time period being measured. The map above shows a snapshot of 2010, and the article - and the Census report on which it is based - is comparing the increase in people living in poverty areas between 2000 and 2010. Hmmm, 2010. Wouldn't that be at the height of the foreclosure crisis and the Great Recession (I don't like that moniker, but it has become the most widely-used)? The one that hit Arizona and some other previously-booming Southeastern states particularly hard? AND, the year that Arizona was in the midst of the SB1070/illegal immigration enforcement conflict? Arizona's increase from 24.0% in 2000 to 33.4% in 2010 was only the 19th largest increase (in percentage) among the states, but we jumped two shades of blue because we were just below the 24.9% cutoff in 2000 and 3.4% above the deepest blue minimum in 2010. Arizona's economy certainly has improved since the depths of the crisis and it would be interesting to see a new map with 2014 rates. However, we might not see refreshed statistics for awhile. While a couple of Arizona counties moved from one category to another (higher) category, Maricopa County - far and away the state's most populous - jumped from "0 - 9.9%" to somewhere in the "25.0 - 49.9%" category! In other words, the percentage of the population of the Phoenix area living in a census tract with at least one-fifth of its residents in poverty climbed somewhere between 15.1 and 49.9 points. Although it likely did not happen, the rest of the state could have improved while conditions in Maricopa County worsened to the extent that Arizona looks like it joined "the South". Earlier, I mentioned the recession, the foreclosure crisis and the immigration issues. These issues likely all contributed to the spike in poverty concentration. The recession and the foreclosure crisis are obvious, and Maricopa County bore the brunt of the latter because it had been the center of the boom area. Maricopa County was the also the epicenter of the illegal immigration enforcement universe (e.g. Sheriff Joe Arpaio) in the couple of years before 2010, and a number of undocumented immigrants who had been living and working in Maricopa County were leaving as a result of the recession and the enforcement; that undoubtedly added to the slowdown of the Maricopa County economy (and thus, the income levels of people remaining in the county). $2.1M of GoDaddy's extraordinary success has funded the very-visible Christine Jones for Governor campaign, while Arizona Treasurer Doug Ducey has not had to use Cold Stone's success to finance his gubernatorial campaign - instead relying on fundraising efforts. Former Mesa Mayor Scott Smith has put a six-figure loan into his campaign checkbook, but has raised 3/4 of a million from individual contributors. These are the bottom line takeaways from the new finance reports which were required to be filed by last night. Arizona's Politics will be updating its tables later today and digging deeper, but wanted to publish something to whet your appetites.